Take a ride around this beautiful city with a tour of Jumeirah Mosque, a photostop at the marvellous Burj al arab-the world’s most luxurious 7 star hotel, golf club, photo stop at Burj Khalifa-the world tallest tower at 830m (by the way Matheran is only 800m), drive thru palm islands, photo stop at Atalantis hotel, take the Jumeirah Palm monorail ride and a visit to the glittering gold souk. Take a ride in the traditional dhow cruise with dinner-enjoy the spectacular night life of Dubai on board the cruise. 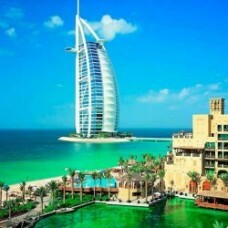 Add some of the optional tours listed below to make your Dubai trip fun filled. Balance 50% prior to Guest Check In. 25% refund for cancellation between 8 - 15 days prior to the tour date. 50% refund for cancellation between 16 – 20 days prior to tour date.